Air source heat pumps are an air to water heat pumping system, very similar to air to air systems, which uses energy in the air to provide us with central heating, cooling and domestic hot water. Thermal energy is present in the air around us. We can even extract thermal energy from the outside air in nature at sub-zero temperatures. It is a source of renewable energy and within everyone’s reach at no cost. Thermira air sources heat pumps only uses the electricity necessary to make the compressor, the electronics and the water pump work, providing up to 4 kWh of heat for each kWh of energy used. The system is more and more in demand by customers who are looking for an optimum level of comfort and maximum energy savings, all by using renewable energies. It is the ideal system for reducing energy consumption and CO2 emission, using a single source of energy for all the different needs at home (central heating, air conditioning and DHW). It is perfectly adaptable to the majority of different kinds of homes, as it works with underfloor heating, fan coils and conventional radiators. From the control panel you will be able to regulate and manage the exact temperature you want at home for maximum efficiency and comfort, supervising both the temperature you desire for heating in the winter and for cooling in the summer, together with the DHW tank temperature. Thermira has various different modes of operation and functions that you can select and programme for better performance, adjusting it to your needs at each moment. In line with Thermira as an efficient, sustainable and renewable energy, Gabarrón has introduced two new air to water heat pump models: Thermira Monobloc and Thermira Plus, with improved performance and more extensive adaptation to different facilities. Both models improve seasonal efficiency, reach a higher water pumping temperature and provide great savings in electricity consumption. The great advantage of air to water heat pump Monobloc is that, it is designed as a compact piece of equipment – “all in one” – installed directly on the outside of the building, saving space inside and with no need for cooling installations in the house. The performance of Thermira air to water heat pump is excellent, even with outside temperatures as low as -20ºC. 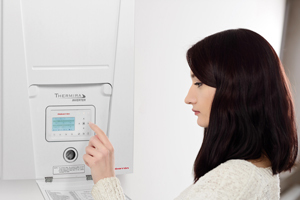 It has become the perfect alternative to other more traditional but less efficient heating systems. The new Thermira air to water heat pump models meet the most recent Ecodesign and CE marking standards, their seasonal efficiency is excellent and their energy classification is A++.